2018 has been a turbulent year for the Tanzania financial sector, five community banks got closed by the Bank of Tanzania (BoT) in early 2018 due to inadequate capital requirements. A couple of new banks entered, latest bank China Dasheng Bank Limited, got granted a banking license by the Central Bank of Tanzania (BOT), as a new commercial bank as of November 2018. 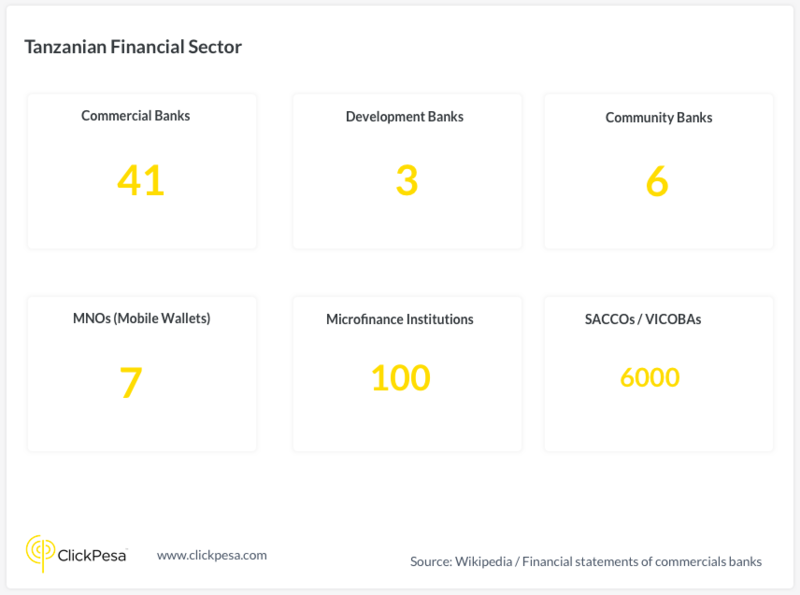 To date (December 2018), the Tanzania financial sector exists out of 41 commercial banks, 3 developments banks, 6 community banks, 2 microfinance banks, 7 MNOs, around 100 microfinance institutions, approx. 6000 SACCO’s and many VICOBA groups. Banks and Mobile Network Operators (MNOs) are key players in the Tanzania financial sector. Banks play a big role in deposit holding, lending and corporate banking activities. Although MNOs are dominating consumer to consumer payments with their mobile money scheme, they solely act as operator of the mobile money scheme whereby banks act as deposit holders of the actual funds. The banking sector is dominated by two former state banks; CRDB and NMB, holding as of September 2018 35% of total banking assets and a combined 40% of the deposits. 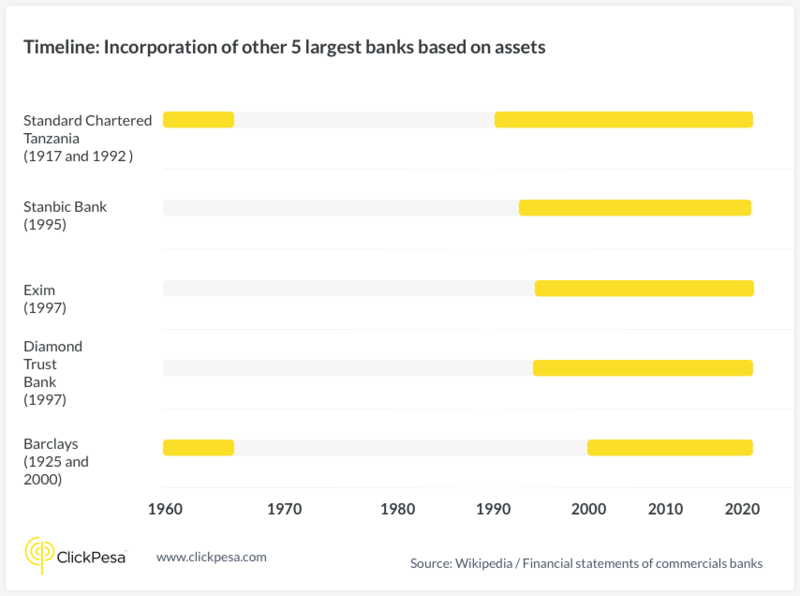 The top 5 largest banks have over 50% of the total banking assets. This makes the Tanzania’s banking sector effectively an oligopoly. The Tanzanian banking sector has evolved from a small banking landscape in early twentieth century to a vibrant sector today. An important twist occured in 1967, when the Tanzanian Government nationalized financial institutions, and merged them to a handful of state banks. 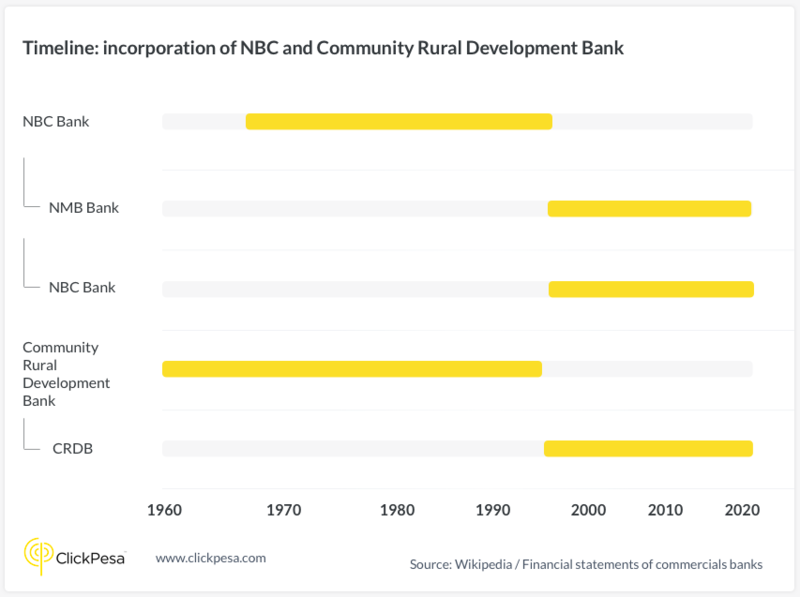 The largest state banks formed in 1967 where NBC and Cooperative Rural Development Bank. After the break-up of National Bank of Commerce, NBC (1997) Limited was formed as a microfinance bank and the Government of Tanzania retained ownership. In 2000, the South African banking group, Absa Group Limited, acquired a majority stake in NBC (1997) Limited. The Government of Tanzania retained a 30% shareholding and the International Finance Corporation (IFC), a member of the World Bank Group took up 15% shareholding in the bank. The new entity became known as NBC (National Bank of Commerce (Tanzania) Limited. Also in NMB the Government of Tanzania retained ownership. Initially NMB could only offer savings accounts, with limited lending capabilities. In 2005, the Government of Tanzania decided to privatize NMB, divested 49% shareholding to Rabobank of the Netherlands. Over the years NMB further divestiture by the Tanzanian Government and a subsequent listing of the bank’s stock on the Dar es Salaam Stock Exchange (DSE) has resulted in a diversified ownership structure. The Cooperative Rural Development Bank, which main objective was to finance rural and agriculture development projects, was privatized, recapitalized and restructured in the 90s and to form CRDB bank in 1996. DANIDA played a significant role in re-structuring the new institution and remained a small shareholder in the bank. On June 2009 the bank listed almost 50% shareholding on Dar Es Salaam Stock exchange (DSE). Another significant shareholder is PPF Pension Fund. The bank is one of the main providers of agriculture finance in the country. As a result of the privatization and liberalization act in the 90’s, the Tanzania banking sector has been professionalized with emphasizing on enhancing quality and efficiency of credit allocation. The act stimulated an increase in the competition field, since then many new players have entered the Tanzanian Financial Sector. New banks established such as (Exim Bank, Access Bank, Azania Bank, etc), East African regional banks entered (CBA, Equity Bank, etc. 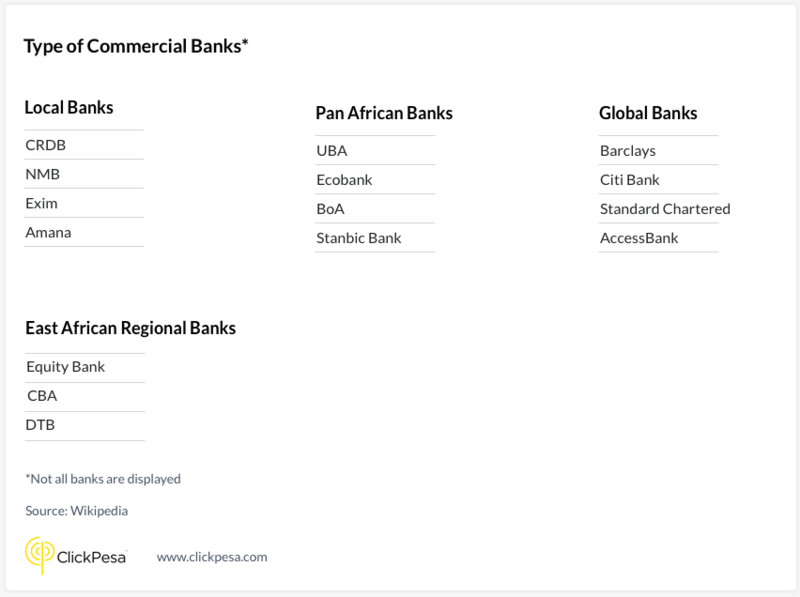 ), Pan African banks entered (Stanbic Bank, UBA, Ecobank, etc) and global banks (Citi and Barclays) entered the market. Informal community saving groups have been formalized into Community Banks such as the Kilimanjaro Cooperative Bank, Maendeleo Bank Plc and Mufindi Community Bank Plc. Especially the last 10 years the financial sector has evolved and rapidly grown in terms of assets and deposits held. According to the latest economic bulletin from the BoT for the quarter ended September 2018, the country’s commercial banks have total assets of TZS 32.569 trillion/- (USD 13.913 billion / 2300 TZS = 1 USD) from TZS 7.849 trillion/- (6.7 billion / 1200 TZS = 1 USD) in September 2008. The growth was attributed to the entrance of new banking institutions, retention of profits and additional capital injection, the Banks of Tanzania indicates. Looking to the banks individually, CRDB is the largest bank in the country in terms of both assets and deposits, closely followed by NMB. The two biggest banks of the sector alone own over 35% of total assets in the industry and hold a combined 40% of deposits. CRDB and NMB have left a large gap between themselves and the third largest bank (NBC) in concentration of banking assets and deposits. 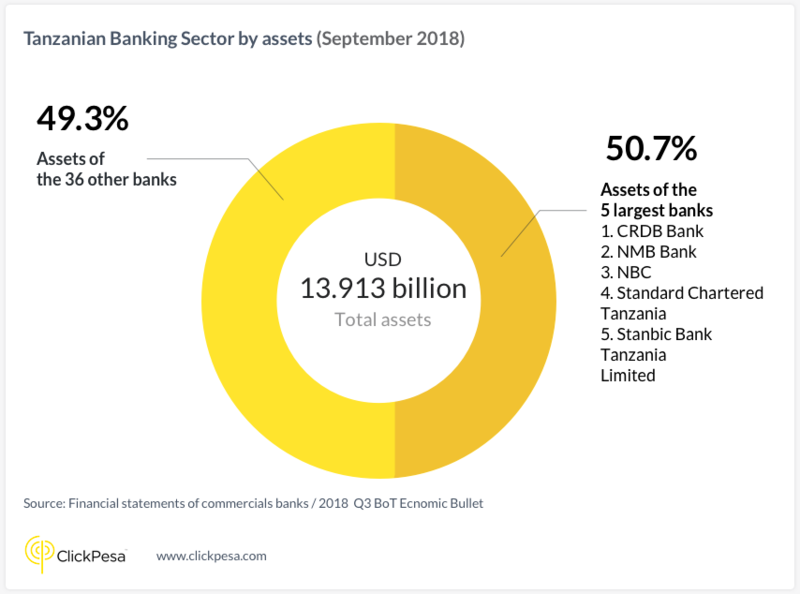 The five biggest banks together own just over 50% of the 32.569 trillion/- in assets held by Tanzanian banks despite the presence of 41 commercial banks operating in the country. The five banks also control a large share of customer deposits in the sector. According to the latest banking report of BOT, the banking institutions in Tanzania had an overall branch network of 702 branches in 2014, compared to 642 in 2013. Most of the branches were located in major cities of Dar es Salaam, Arusha, Mwanza, Mbeya, and Moshi. Dar es Salaam had 255 branches which constituted 36.32% of all branches, followed by Arusha, 50 branches (7.12%), Mwanza, 46 (6.55%), Mbeya, 38 (5.41%) and Moshi, 32 (4.56%). However Tanzania still ranks in the bottom quartile of countries in terms of access to traditional financial services, with only 2.5 bank branches and 6.4 ATMs per 100,000 adults. In 2014, the overall number of banking agents grew by 180%, from 591 in 2013 to 1,652. This is a result of the comprehensive agent banking guidelines introduced by BOT in 2013 that permit for the first time licensed banks and financial institutions to appoint retail agents for their banking services. Accordingly, the introduction of agent banking provides a mechanism, through which banks can profitably extend their services to previously unbanked lower income individuals. Mobile Network Operators (MNOs) became active in the Tanzania financial sector in 2008 with mobile wallets attached to a phone subscriber’s SIM card. Vodacom starting with M-Pesa, other MNOs followed suit such as Tigo, Airtel and Zantel and recently entered Halotel and TTCL Pesa. 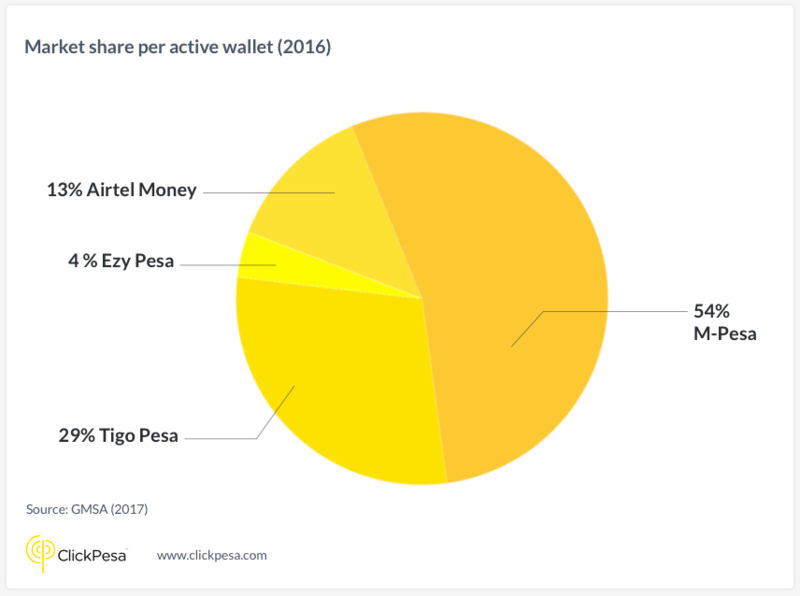 Mobile money dominates the consumers to consumer payments. In 2015 mobile money regulation came into effect regulation and formalizing the mobile money sector. In 2016 half of Tanzania’s GDP went through the mobile money system. By 2016, there were more than 260,000 active mobile money access points throughout the country, or one for every 103 adults. These services have reached out to customers, educated users how to use m-wallets to transact, offered cash-in, cash-out (CICO) and other services. Savings and Credit Cooperatives Societies (SACCOS). SACCOs play an important role in the provision of micro-finance. By March 2013 of the national total of 9,700 registered cooperatives, 5,559 were SACCOs, with 45% in urban areas – an increase from 5,344 in 2011 (EI). They included 1,153,248 members, representing about 25% of clients in the financial sector (both formal and semi-formal organizations) (WB 2013). Micro financing in Tanzania started in 1995 via SACCOS (savings and credit cooperative organization) and NGOs. Microfinance refers to provision of financial services to low income clients. Many of the banks also entered the microfinance market, also independent players entered the market such as Yetu Microfinance, established in 1997, recently transformed itself as a bank. The rapid and successful growth has resulting in a separate regulation for micro financing: National Microfinance Policy, 2000 andThe Microfinance Regulations were approved by Government on 25th March 2005. The Village Community Banks (VICOBA) concept brought to Tanzania in 1996 are mostly informal small groups mobilizing financial resources by saving and giving out loans among people within groups. Exact numbers are missing, due to that most groups of informal organized. VICOBA’s has proved a success in boosting and raising incomes among different community members in the Tanzania over the years.